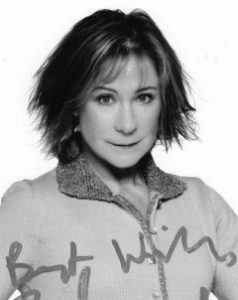 Zoe Wanamaker is an American-born English actress, best known for playing the role of Susan Harper in the popular BBC sitcom My Family (2000–11), opposite Robert Lindsay who played her on-screen husband, Ben Harper. She also played Ariadne Oliver in the British television series Agatha Christie’s Poirot, and portrayed Tessa Piggot/Tessa Carver in the drama series Love Hurts. Zoe has also appeared in such films as Wilde (1997), Harry Potter and the Philosopher’s Stone (2001), It’s a Wonderful Afterlife (2010), and My Week with Marilyn (2011). Throughout her career, she has received nine Olivier Award nominations (won for Once in a Lifetime and Electra), four Tony Award nominations (for Piaf, Loot, Electra , and Awake and Sing! ), and two BAFTA Award nominations (for Prime Suspect and Love Hurts). Born on May 13, 1949 in New York City, USA, to parents Sam Wanamaker and Charlotte Holland, Zoe was raised in England. She is of Ukrainian descent on her father’s side. She was educated at King Alfred School in Hampstead and Sidcot School in Somerset. Since November 1994, she has been married to British actor Gawn Grainger. *She was born in New York City on May 13, 1949. *She became a British Citizen in 2000. *She received a CBE at Buckingham Palace.